Here are just some of our happy customers. Scroll down for reviews. The service and care I received from Dr Diep and her team was outstanding, their attention and gentle workmanship much appreciated. I had a lot of work done over a seven day period, 4 crowns, an implant, filling replacements, cleaning, X-rays, whitening and a take home kit. All for 1/4 of the price in NZ, and I am sooo happy with the job. Dr diep goes out of her way, even calling my hotel to make sure I’m feeling okay, even collecting me in a taxi, to come back to redo an impression she wasn’t quite happy about. She and her team work well together and long hours to get it done right, they have much pride in their work, and keeping you relaxed and comfortable all the time. Thank you so much team Diep! I highly recommend you! I needed extensive work done on my teeth, 21 crowns including 2 bridges due to excessive wear from a teeth grinding habit during sleep. Dr Diep and her team’s work is first class and the results were above expectation at a very reasonable cost. I highly recommend Dr Diep’s clinic to anyone needing any dental work done, and would like to sincerely thank them for the amazing results and my new smile. My Wife found me the lovely Dr Diep last year, since then I’ve had a 3 tooth bridge and a large crown over a rear molar I thought was lost. 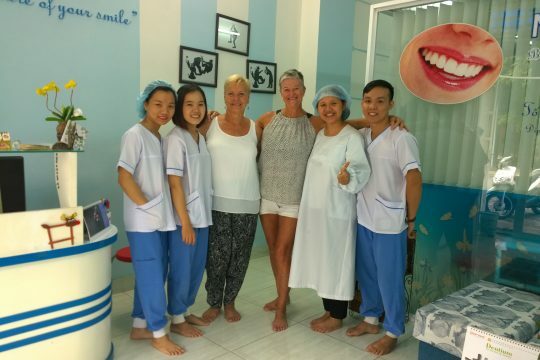 Very professional and skilled dentist, her English is very good giving precise explanation of the treatment. Very clean clinic in a good location. I’ll be back for further treatment. 1 rear crown 2days. $260, bargain. Thank you Dr Diep. Very professional dentists. I visited the dentist here after having a toothache for four days. I was able to get the same day appointment, the dentist was very professional and friendly, did an Xray for me to make sure everything is fine and the price I paid was very reasonable. Very trustworthy service, they told me there was nothing wrong with my tooth and the pain is a result of teeth grinding at night and it should go away within a week (it did). So all I paid was the Xray. My husband and I found Dr Diep and the team to be incredibly friendly and kind. When explaining procedures they took the utmost care to ensure we understood and were comfortable with the next step. We would highly recommend them to anyone who needs work done. The quality of their work is outstanding and their personal care is notable. I’d like to thank Dr. Diep (boss lady) and her incredibly amazing, friendly, honest, caring and professional team in her clinic. They have done amazing work and I can’t stop smiling now! I would highly recommend coming here for any dental work. Very clear with procedures and honestly care about you. Very clear on what work you really need done and how they are going to do it. Love and appreciate all the work they done in the small time frame they had to do my teeth in. (10 working days). Work done: polish and clean, 15 porcelain crowns, 5 roots canals, 8 fillings and 4 wisdom teeth extractions. I wanted veneers because of my bite and teeth grinding. She was honest with me and told me they wouldn’t last and the crowns was the best option for a longer lasting smile. My bite is perfect now and my smile is something I can’t help, but show off! Thank you, Dr. Diep and your professional and friendly team! Much love from your new friend. Needed a night guard as the hotel staff in Halong Bay managed to throw out the one I purchased two days earlier in Hanoi. For the price of the night guard alone, she made a new mold for me. She sent it out to the lab to be made but wasn’t happy as it wasn’t quite as thin as one I had told her I wanted. She wanted to have it re-done at no charge, but upon putting it in, it was perfect and even better than I ordered. Quality work, gentle/caring Dr. & staff. I highly recommend! In addition, my friend purchased a cleaning and 2 fillings and went back in the afternoon for teeth whitening and is so happy with the work and her new smile, she no longer takes photos with a closed mouth! I was coming to Hoi An for a holiday in June and I knew I needed some dental works done (crowns). I did some research to try and find a dentist I was comfortable with. It is a big leap of faith to have someone in a foreign country work on your teeth. 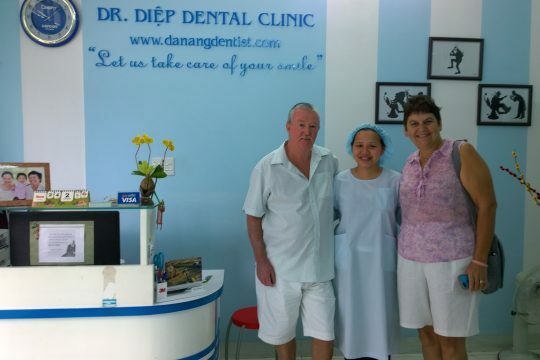 I had read good reviews about Dr Diep in Danang and booked an appointment with her. I thought I had 6 or 8 crowns to be done, however after examination Dr Diep said I needed 20 (yes twenty!) crowns done. Her explanation was a good one, she said all of the teeth impacted all others and it was better to do them all at once. I was only in Hoi An for 7 days, however Dr Diep was able to schedule me in for a half-day of treatment each day for 5 days. I initially blanched at having 20 crowns done (based on the pain, the cost and the disruption to my holiday), however I am know incredibly glad I did! Crowns here in Sydney are $1,000-1,500AUD each (and I had a friend who just paid $3,000AUD). By comparison, Dr Diep offered great value at around $320AUD per crown. Dr Diep and her team were incredibly professional and did a much better job than I think I would have got in Australia. They spent countless hours making sure the crowns and the fitting were correct, While at times I just wished they would finish and I could get on with my holiday, I really appreciate the patience it took to make sure everything was absolutely right. Dr Diep and her team transformed my teeth and my smile, and I could not recommend the outcome or the value highly enough. 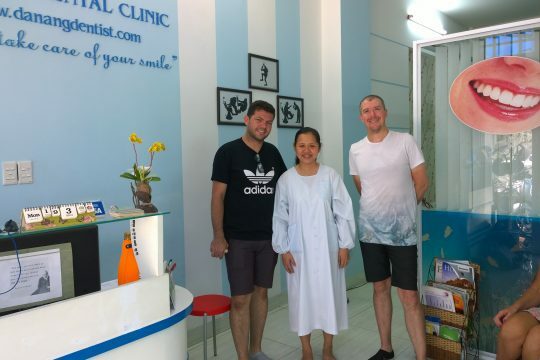 On a side note, the clinic is a friendly and hygienic place in a nice neighborhood of Danang. Don’t be afraid that it is not a big, sterile, multi-story building. An outstanding service, great quality and value for money. Diep and her team are professional, highly skilled and dedicated to providing top class dental solutions. I had 6 crowns (all rear teeth) and a filling, all completed over 3 visits. My crowns have been in place now for over 5 weeks, they look and feel natural and I have not had any problems with them. Diep is able to speak English and takes the time to explain all available options. They work hard, the surgery staying open until after 9pm for one of my visits. Diep was also able to arrange a private driver and car to pick me up and drop me back at my hotel in Hoi An. I was able to meet a number of other clients (8) during my visits. All had nothing but positive comments regarding the treatment they had / were receiving. Keep up the good work Diep – and good luck in the future. 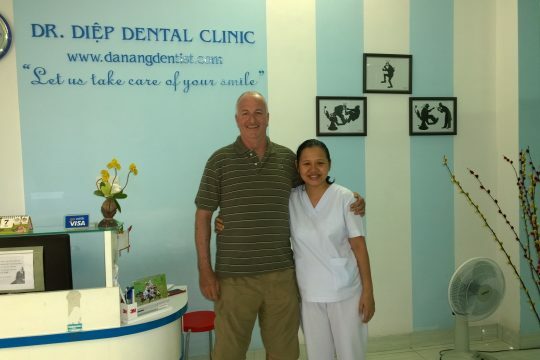 Dr Diep is probably the best Dental Clinic in Da Nang! She’s very professional and goes beyond her duties by attending to me despite the last minute notice. Superb job done and I cannot be grateful enough. Well Trained staff and great facilities. Thank you again Dr Diep and see you in Da Nang next time! 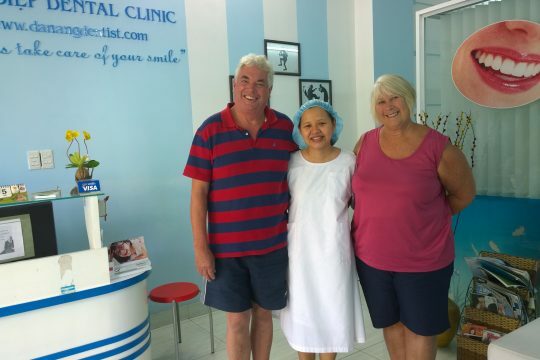 I would like to highly recommend this great dental clinic to anyone living or visiting Danang. Dr. Diep and her staff are amazing! They are very friendly, talented and can help you with anything you need. The facilities are very clean and it’s very easy to get there. I’m very happy with the results. Thank You Dr. Diep once again! I went to the clinic nervous but immediately Dr. Diep put me at ease with her winning personality. She is approachable, listens and clearly has your interests at the core of her business, which is run efficiently but relaxed. Dr.Diep and her wonderful team provided me with the best medical experience of my life. I was quoted for the treatment – one crown which turned to be three, a three teeth bridge and a denture – which was about 25% of the UK price. But Dr Diep carried out significantly more work in trying to align my teeth. There was never any suggestion of additional payment. The treatment was painless, professional and punctual. I can smile again and I feel confident to open my mouth. It has quite simply been a life changing experience. I can eat with comfort and speak in a non-contorted fashion for the first time in years. Most importantly, I am pain free. I went to get my teeth looked at and I was very very surprised to find out how good and friendly they were, I would not hesitate to tell people to go there. Diep went out of her way to help me. Once again thank you to the tooth fairy and her staff. Both my wife and I have no hesitation in recommending Dr Diep and her wonderful team. 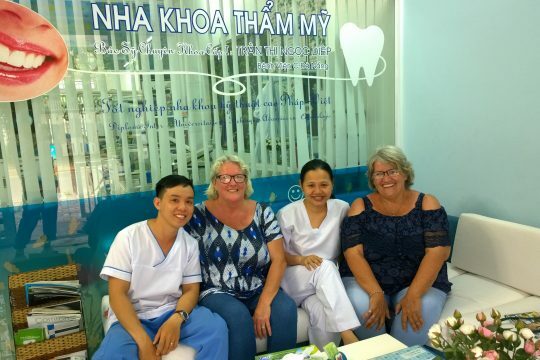 We recently had a great holiday in Hoi An and during our stay took the opportunity to undergo considerable dentistry work at Dr Diep’s Cosmetic Dental Clinic. We found Dr Diep to be both skilled and caring and we are both extremely pleased with the end result. We received a number of crowns and bridges that look great at a fantastic price. We visited Dr Diep’s clinic over several evenings and were still able to enjoy every day of our holiday. My only regret is that I didn’t visit Dr Diep earlier, and would recommend her clinic to any traveller visiting Vietnam. I have been a long time patient of Dr. Diep and I am always satisfied with the level of service. Her staff are wonderful and I have always been treated with kindness. 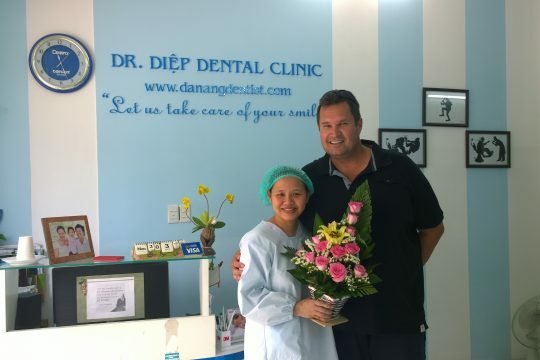 I recommend Dr. Diep if you are a long time resident of Danang or a visitor passing through, she is very professional and goes out of her way to accommodate her patients. Keep up the good work Dr. Diep. I visited Dr Diep May 2013. A large filling that had fallen out months ago and had been putting off seeing a dentist but now it was beginning to hurt. I found Dr Diep via the Internet and set up an appointment. She did a fantastic job, I needed a crown to replace the tooth at the front that was giving me problems, I chose a porcelain crown although I was given cheaper options. I am more than happy with the result. The shape and colour are perfectly matched. All throughout the procedure she was efficient and gentle, there was very little discomfort. All up with the crown and cleaning I only paid $265. I will be coming back to Vietnam again in a few months and will have more work done by Dr Diep. You have fixed my crown today as “an emergency case” 🙂 even if today is Sunday. Thank you very much for your wonderful care, your explanation and recommendation. You are very friendly and nice. I highly recommend you to everyone who needs dental care in this area. Please note all of these reviews come from our Facebook and Google reviews.